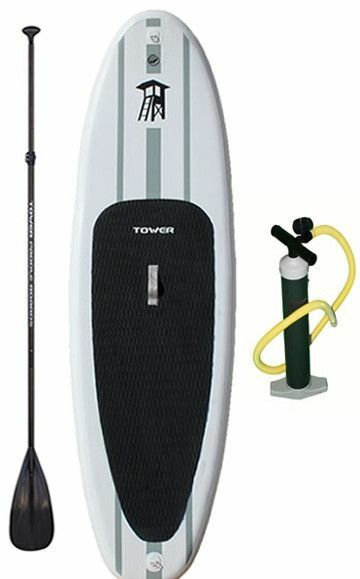 There are so many inflatable paddle boards manufacturers which are exempt of introductions and Tower Paddle Boards is one of them. Indeed, this is a brand that’s been in business for quite a long time. More significantly, this is a brand that has put out some of the most remarkable inflatable paddle boards throughout the years, gaining the trust and approval of a large slice of paddlers; hence comes the Adventurer 1. This is an awesome inflatable board with enough potential to put it on the list of best sellers for a decade to come. Indeed, the Adventure is a perfectly versatile board with plenty of little specs and attributes that will make your experience worth a while. So, let’s talk about that. The size of a board will not only determine whether it’s the right fit for you or not but it will also significantly impact its performance and category. Hence, the Adventurer comes at a comforting 9 feet 10 inches in length which could be the best thing about this board. In fact, at this exact length, the board is set to be compatible with pretty much 90% of paddlers. Accordingly, if you’re a teenager, a young adult or an average size adult then this board is definitely made for you. Further, the length of the board is also known to be very impactful in terms of performance which is further emphasized under the performance tab. Width is also an especially critical dimension and specifically for beginners. Indeed, there is a significant value to wide boards and that’s why Tower went with a reliable 32 inches. At this width, you’ll be granted the upper hand when it comes to balance and stability under most circumstances and that is something which cannot be achieved on a smaller board. Also, this aspect will significantly improve your grasp over the commands of the board and make navigation and tracking a lot smoother for you. As far as thickness is concerned, it is important to note that it is just as significant as the previous 2. One of the most common mistakes that iSUP manufacturer used to fall for is cropping thickness out of their focus scope and that resulted in a bunch of weak boards that end up bending at the center under a lot of weight. Hence, The Adventurer 1 features 6 inches in thickness which is awesome. Thick inflatable paddle boards are more stable and tend to handle a lot more weight than thin inflatable paddle boards. Speaking of which, this board can cater for a maximum weight of 350lbs. Quality is as important as measurements but not more important; because trust me, quality would be your least concern if the board is smaller or bigger than your fit. Nevertheless, quality is still a prominent criterion upon which we make most of our purchases and iSUPs are no different. 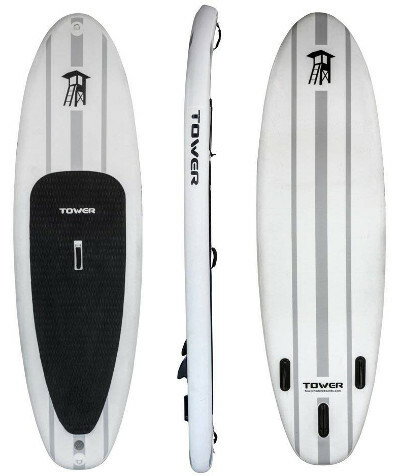 Accordingly, the Adventurer is here to represent Tower Paddle Boards which is a brand known for building all of its boards out of military grade PVC material. This, actually, is the same stuff the military uses to build zodiacs and some bullet proof vests. Further, and to make sure that nothing goes unplanned, the Adventurer is then reinforced via an industrial drop stitch construction which perfectly seals all seems on the hull, making it virtually indestructible. An Olympic grade EVA gripping pad, covering over 50 percent of the board’s surface and granting you enough space to move around and adjust yourself comfortably as you go. More importantly, the EVA pad will also grant you an impeccable grip on the board, allowing you to cruise at ease and command the board in a better fashion. 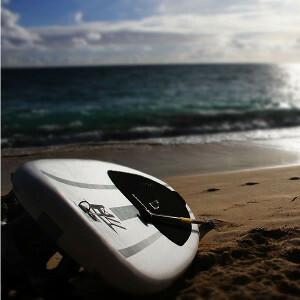 The board also comes with a clean design with less and less distractions, enabling us to enjoy paddle boarding in its authentic form. Indeed, this is one of the smoothest looking boards on the market and that entails the quality of the board, the original design and the comforting colour scheme. The Tower Adventurer comes with a limited set of 2 D-rings located at the extremities of the board. These rings can be used to tow or secure the board at ease while not disturbing the authenticity of the hull. To be fair, some paddlers do prefer an iSUP with an abundance of D-rings for storage and such but that goes down to everyone’s personal taste. As far as navigation is concerned, the Adventurer does not take any chances and goes with a triple fin system. This system might not look appealing but it definitely puts in the work. Accordingly, whether your opponent is a crystal clear lake or a Colorado white-water river, you’re perfectly set to make it your little female dog. Performance is definitely amongst our top concerns when we’re making such purchases but it’s important to note the difference between competitive and entry level boards. Once that’s done then you can learn to appreciate the adventurer as one of the most accommodating inflatable paddle boards. Indeed, this entry level board is made perfectly to fit the character of a beginning / amateur paddler and with that comes the long body, the lifting nose and tight end to make cruising a breeze. Moreover, the triple fin navigation system and width of the board will certainly be noticed with every turn you take and every adjustment you make, the Adventurer will be there for you. The package doesn’t include a carry bag. The board isn’t featured with tie down system. The Adventurer 1 isn’t that fast, granted it’s an all-round iSUP.